Thank you for your interest in the Citizens Bank Pell Bridge Run. We ask that you please review the event website and the below FAQ’s. If you have any additional questions, please contact us at info@graymattermarketing.com. Yes. The event capacity is 4,000 registrants. Sign up early to secure your spot. Yes. All participants must be off the bridge in one hour. This requires a 3 mph. pace. All participants unable to maintain this pace will be escorted off the bridge by race officials. The race starts on Conanicus Ave. at the base of the Newport/Pell Bridge, in Jamestown, Rhode Island at 7:15 AM. Additional course information here. Shuttle times are assigned the week of the event. In order to put on this event, we must comply with strict time constraints and appreciate your cooperation and respect for our requirements. We understand that the early start time, shuttles, and the point-to-point nature of the race adds unique challenges. We particularly ask for your attention in adhering to your shuttle assignment in order to get everyone to the start line on time. Can I get dropped off in Jamestown? Yes. Athletes wishing to be dropped off near the starting line coming from Newport will take the East Shore Rd exit just after the toll plaza and head north on East Shore Road until they arrive at the designated drop off location. Drop-Off Locations Map. Is there a place to leave my belongings at the race start? Can I push a stroller, carry my child, or bring a pet? The event is rain or shine. However, there is always the potential for extreme or severe weather conditions. Race organizers will do as much as we can to ensure the experience is as safe as possible. In the event of severe weather, the race may be delayed as race officials consult public safety officers. If there is more than a short delay, if conditions persist, or the forecast calls for extreme weather, race officials reserve the right to alter or cancel the race. Entry fees are non-refundable. Please check the website, our Facebook page and your email before the race for any changes or cancellations. All entry fees are non-refundable, and there will be no-rain date. There will be one aid station on course. It will be located immediately off the bridge in Newport at Mile 3. Can spectators use the shuttles? No. Only registered participants will be able to use the shuttles and are required to show their race bib to board the shuttle. I would like to volunteer, how can I do this? How much of my registration will be donated to charity? 100% of all net proceeds will be donated to local not-for-profits. 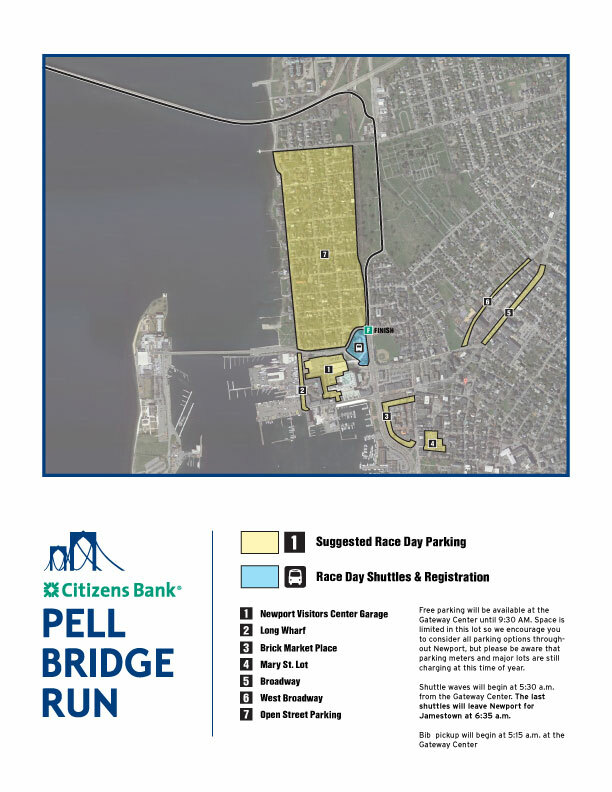 The Citizens Bank Pell Bridge Run Facebook page provides a great deal of information and serve as forums for runners, sponsors, volunteers and event organizers to discuss the race.